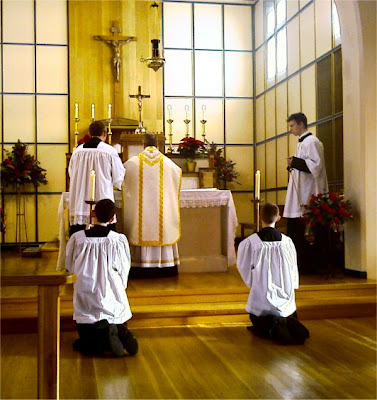 For some time, the Saturday morning Mass in my parish has been celebrated in the Classical Roman Rite. I have a number of boys and young men who have now become confident with the ceremonies of the Low Mass and are eager to learn a little more. Jonathan Hague and Andrew Bosi have kindly offered to arrange things so that we can celebrate this Saturday Mass as a Missa Cantata once a month and today was our first opportunity. The Schola sang a number of extra pieces as well as the propers and Mass XIV. After Mass we had Benediction with the Te Deum, followed by the Marian Anthem. Following all that, we repaired to the excellent Robin Hood and Little John in Bexleyheath for some real ale and pub food. 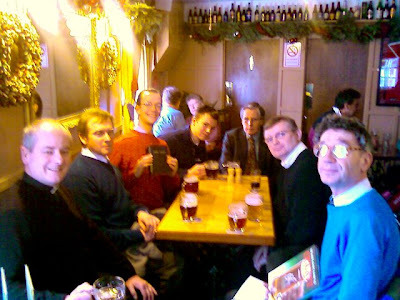 The books being held up (the Liber Usualis and a "Cricket and Real Ale" are intended in Chestertonian fashion to show three things most worthy of celebration in life.